Hoagie is a sandwich building game from Monkeybeak Games. 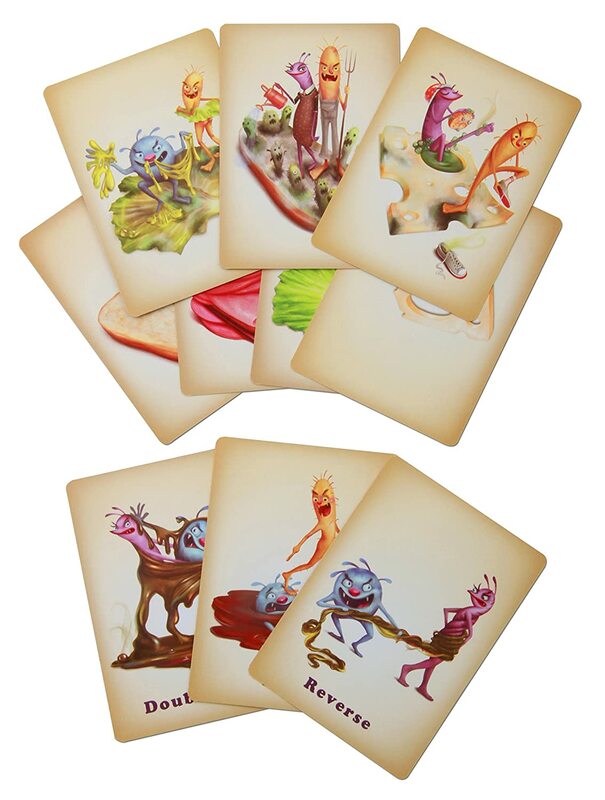 It is a card game for 2 to 5 players that is recommended for ages 5 and up. In this fast paced game each player is trying to build the perfect sandwich without any part getting spoiled by three oogies (pictured on the spoiled food and special action cards). Hoagie’s gameplay is very easy and takes just minutes to learn. Each player is dealt a hand if 6 cards to start the game. On each players turn they play a card from their hand. Several actions with the cards can occur, but only one can occur per turn. The player can play a fresh ingredient in front of themselves to build their sandwich. The player can replace a spoiled ingredient on their sandwich. The player can spoil and ingredient on another player’s sandwich. At the end of the players turn they draw back up to 6 card. In order to win, a player must begin their turn with a perfect sandwich, which consists of bread, meat, cheese, lettuce, and bread. Hoagie is very simple to learn and the only reading needed is on the Skip, Reverse and Double Play cards. Even then, once a younger player is familiar with the picture on each card, the need to read the card is mitigated. The pictures on the spoiled food and special action cards are gross in a silly cartoon way, and are not excessively disgusting or scary, rather Hoagie has a level of gross that kids and adults will find entertaining. The game play is quick paced and the 20 minute time noted on the box is accurate. Hoagie is a light game that can be played with multiple ages all together making it a great game for the whole family. The way the mechanics of Hoagie work, adults and children can easily play together and the children have just as likely a chance of winning as the adults without help. There is some strategy, but there is enough random chance it really is anybody’s game. Hoagie is a wonderful family game that is great for a range of ages to play together. It is easy for young players, and is fun for older kids and adults as well. This is a great addition to any game collection. Teaching Math By Making Up Your Own Rules for the Pokemon TCG! I think I will have to buy this game for our new family Summer game!